A collection of historical information pertaining to families from Greene, Oglethorpe, Walton, Haralson, Catoosa, and Whitfield counties in Georgia; Sevier county in Tennessee; and Anderson county in South Carolina. Also included will be families from Wetzel county in West Virginia, and Armstrong and Westmoreland counties in Pennsylvania, and Glasgow, Scotland. 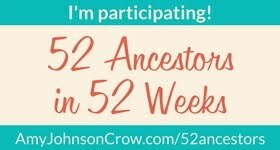 The 52 Ancestors theme this week is “frightening.” This week's post is a stretch of the 52 Ancestors theme but I'm going with it! Uncle Ralph’s slide collection, which dates from 1947 to 1984, contains wonderful photos of family members, friends, co-workers, and their travels. Unfortunately, many of the people in the photos are unidentified. Uncle Ralph passed away in 1998 so is no longer here to help with identification. On my husband Charlie’s last visit with Aunt Jean, he took printed copies of some of the slides. She enjoyed seeing the photos again but was unable to remember who most of the people were. So, I’ve made it a mission to share these photos on my blog in hopes that someone will stumble across them and recognize a family member. I’d love to be able to put names to the faces looking back at me. That last sentence stood out to me! It’s frightening to think about the photos sitting in boxes under beds, in albums stuck in closets, or who knows where else, stashed away for no one to see. We all need to make a point to digitize and share our photos so others can enjoy them. Especially the photos of past generations. Sam must have posted a link to my Skyline Drive-in blog post because it's been viewed over 800 times in the last few weeks ... way more than normal! I know there are people out there who would recognize the people in Uncle Ralph’s photos, as well as other photos my husband and I have inherited. I hope someone does recognize a family member or friend from long ago. My determination is even stronger now to continue my mission of sharing these wonderful snapshots of history. Of course, I can’t post without including a few photos. Uncle Ralph was usually the person behind the camera, but every now and then, Aunt Jean (or someone) took the camera and managed to take a photo of Uncle Ralph. Below are a few of him found in his slide collection.